Who Else Wants To Cut Their Body-Fat Percentage in Half? Vanessa struggled with an unhealthy relationship with food, but after using her pregnancy as an excuse to eat, she committed to a healthier lifestyle and lost 40 pounds! 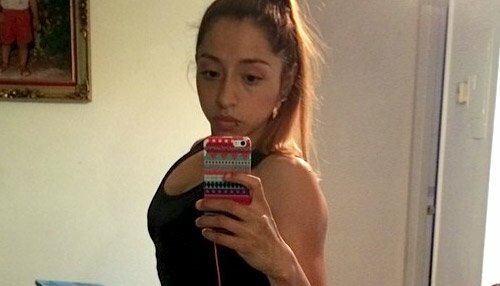 Vanessa Garcia didn't always lead an unhealthy life. 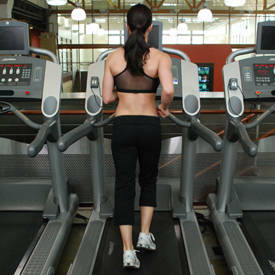 In fact, when it came to fitness, she started off on the right track. Her parents instilled athletics from the start, but things took a downward turn after her family emigrated to the U.S. from her native Mexico. That was when she began struggling with unhealthy habits—a struggle that would plague her for years. "We moved, and I just gained a lot of weight," she says. "My mom didn't want us to go hungry like she had as a child, so she would buy us any food we wanted. I loved Oreos and could eat a whole package in one sitting." A lack of physical activity in America didn't help. "I was always in the house watching TV, and because I wasn't athletic, I was never picked for sports." What started as a childhood pattern of unhealthy eating spiraled into disordered habits. Yo-yo dieting soon turned into skipping meals altogether. By age 14, Vanessa would go days without eating altogether. That was, until night came. "I'd skip breakfast and not eat at school," she says. "Then I would come home and down whatever was in the fridge—rice and homemade tortillas, especially." Despite unhealthy eating, Vanessa began to drop weight. In two years, she lost about 15 pounds. While she knew her habits were not sustainable, she was addicted to the results. "I felt weak but could see that I wasn't as big as I used to be," she says. "That drove me to continue." Vanessa stopped starving herself when she graduated from high school, but continued to struggle with her weight when she got married and had children. Her second pregnancy was the last straw, but this time she took solace in something different. Unhappiness and a marital rough patch led her to seek the gym—rather than food—as an outlet. From that point on, her life changed for the better! 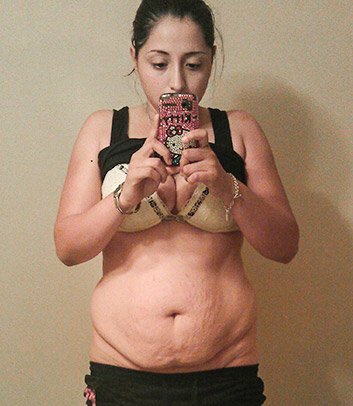 This is how Vanessa transformed for life. What was it about relocating to the U.S. that sparked your childhood weight gain? I'm a very shy person, and coming to a new country really intimidated me. I never talked in school. I let people pick on me. I felt comfortable at home, eating and watching TV. That was my thing. How do you think these childhood comforts fueled your habits as an adult? Food had always been comforting for me, but my pregnancies really became an excuse to fall back into old habits. My family encouraged me to eat whatever I wanted while pregnant, so I did. During my second pregnancy, I gained over 40 pounds. What was your wake-up or "aha" moment? One day after I had my second baby, I was putting on my pants, and I saw my knees—really saw them. There was overlapping fat that had never been there before. I took a picture. It was unacceptable. That's when I started making changes to my diet and walking more. I didn't start going to the gym until after my husband suggested it. Our marriage was really struggling through all of this, and since we were both interested in being healthier, he thought the gym could be something for us to do together. This rough patch with your husband seems like a real turning point for you. What was going on? We got married young—I was 19 and he was 18. We weren't talking much, and considered breaking up. The gym became our saving grace. After my husband started going with his brother, he suggested I join. He liked the equipment, but more than that, he liked the atmosphere, the intensity, and the encouragement from others. He said it was something we should do together. I knew I needed to lose some of the baby weight—I wasn't comfortable with myself—but I was still scared of weights. 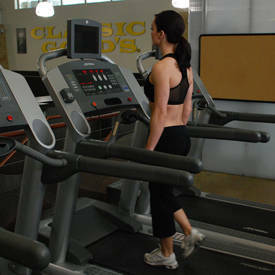 I told him I'd go and just stick to cardio machines because I didn't want to "bulk up." What results did you see from that? I did 15 minutes three times a week, and to be honest, I saw no change. That was really discouraging, and I didn't want to go anymore. I began to realize weight training was necessary. I started to learn that there's no difference in workouts for men versus women. I did everything my husband did and started to see results. When did you integrate lifting into your routine? My husband and I would go to the gym, and he'd say something like, "It's shoulder day." At first I thought, "Wait, wait, wait! I don't want to look like a man!" but my husband kept encouraging me. I started to learn that there's no difference in workouts for men versus women. I did everything my husband did and started to see results. What healthy changes did you make to your diet? I began by cutting out sugary drinks as well as pasta, bread, and junk food. It was so hard, especially coming from a Mexican background—all we eat is tortillas! I sometimes looked at myself and didn't see the changes as quickly as I wanted to. I would try to speed up my progress, which in reality actually made me plateau. I deprived myself of what I wanted to eat, but still hit a plateau at 120 pounds. I would say, "Why am I doing this? I'm not seeing results." Last year, I finally saw that nutrition and feeding your body properly is the key to success. I started to give my body nutrients and trained hard. Instead of doing small portions, I would eat more, so I had the fuel to work out. Through that, I gained weight, but it was muscle and definition. 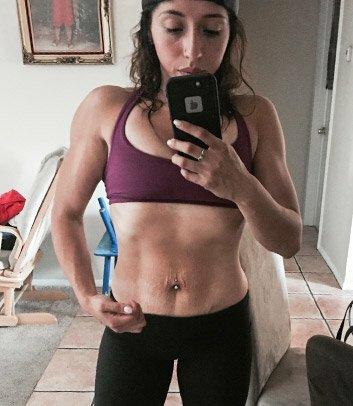 I became less obsessed with my body fat and learned to love the process. It was scary at first, because I didn't want to gain weight, but I knew I needed healthy carbs and protein. Like for most, the diet was the most challenging—and it still is—but I try not to beat myself up over eating something I shouldn't. I try to eat clean 90 percent of the time and see training as a reward. 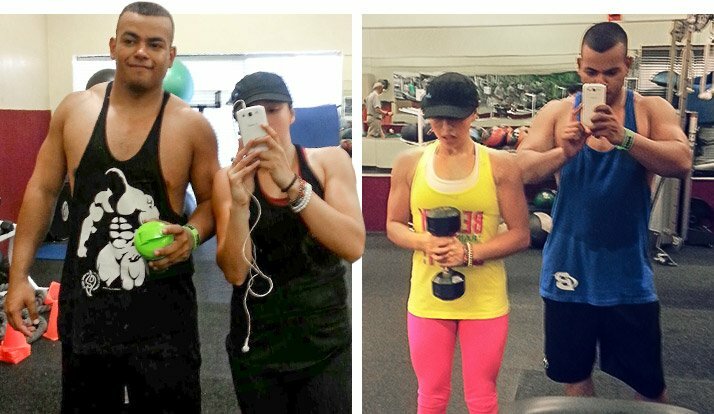 How did going to the gym affect your relationship with your husband? It was the best decision we made, and a thing we both started to like. At first, we didn't train together. He did weights, and I did cardio. We both started to eat properly and go to the gym after work. We looked forward to it. They have a daycare there, so it was actually "us" time rather than time spent at home with the kids, arguing. The gym gave us some common ground. We eventually did the same workouts, so we'd give each other advice and encouragement. How did Bodybuilding.com change your fitness goals? My husband had a friend who always mentioned Bodybuilding.com. I didn't know what that was, so I looked it up and browsed the site. I really couldn't believe a site like this existed, and wish I would have known earlier. What really got my attention were the transformations. I found them inspiring and tried to read them all in one sitting. It probably took me two days. I found [the Bodybuilding.com transformations] inspiring and tried to read them all in one sitting. It probably took me two days. What did you learn on the site that you applied to your own transformation? Never give up! I didn't see fast results, so I would try to speed things up by cutting down my calories and depriving myself. Just having somebody tell me to keep going gave me motivation. Support was also key. Sometimes I would look through pictures of fitness models and know I would never have a stomach like them because of my pregnancies. That can be discouraging. But my husband always told me I looked good. Change doesn't take one day; it takes years. That made me realize slow progress was OK.
You have two young children, and you just finished your bachelor's degree last spring. 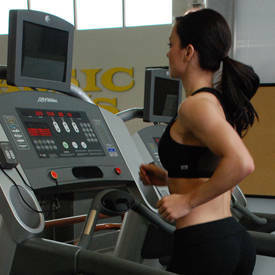 How do you stay motivated to make gym time a priority? There was a six-month period where I was working my full-time job, working part-time on the weekends, and going to school—yet I still managed to get to the gym after work. I only took Sundays off. It was a lot, but I was proud of myself. I still use supersets and HIIT cardio when I'm low on time. You don't have to spend an hour at the gym to get a good workout. It's really all about the intensity. What advice do you have for others trying to balance busy schedules and healthy lifestyles? There is time, you just have to find it. You have to make time for you. There are a lot of obligations, but even 30 minutes can help. Our minds and bodies are capable of amazing things when we put in hard work and dedication. As long as you work for it, you will conquer it. How do your kids affect your fitness journey? I'm an example of healthy living for them. What really surprises me is that my younger son will pick water over soda any time. Even when we go to restaurants, he wants water with a lemon. That made me realize my kids are watching my habits and learning from me. They also see me doing fun workouts like practicing headstands or doing pull-ups and ask if they can try. I want to become a trainer and have a home gym where people can come if they don't feel comfortable going to a public gym. It's not about the money; I would just do it for fun. I want to become a trainer and have a home gym where people can come if they don't feel comfortable going to a public gym. It's not about the money; I would just do it for fun. Right now, I work out with people like my sister. I help her with her workouts. I've helped several of my friends. I love doing it and can relate because I've been through it. I can tell people from experience what has worked for me and what hasn't. I know the struggle, especially with being a mom. I can give people my advice and my encouragement because I've been where they are. As I mentioned, the Bodybuilding.com transformations inspired me daily. When I felt like quitting I remembered that, if those people did it, I could too. My husband was also a huge part of my success. He is in love with fitness as much as I am, and it's our lifestyle. I am so blessed to have him and my children in my life.